Cobra is a word which means "snake" in Portuguese. In English it is the common name for various venomous snakes. Most of those species are in the family Elapidae, and most of them can spread their neck ribs to form a flattened, widened hood. The name "cobra" is short for cobra de capelo or cobra-de-capelo, which is Portuguese for "snake with hood", or "hood-snake". Cobras usually live in tropical and desert regions of Asia and Africa. When feeling threatened, cobras can tilt back and flatten their heads into their warning posture. The rest of the time their heads are symmetrical and they look much like any other snakes. 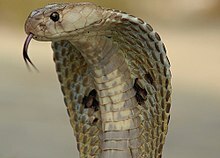 The genus Naja, the typical or "true" cobras (they raise the front part of the body and flatten their neck in a warning signal when alarmed). They are a group of elapids found in Africa and Asia. They include over 20 species, including Naja nivea, the Cape cobra, a medium-sized, highly venomous cobra which lives in biomes across southern Africa; Cleopatra's "asp" (the Egyptian cobra, Naja haje); and the Asiatic spectacled cobra Naja naja; and the monocled cobra, Naja kaouthia. Spitting cobras, a subset of Naja species which squirt venom from their fangs in self-defence. Most so-called, and all "true", species of cobras belong to the family Elapidae. Wikimedia Commons has media related to Cobra. ↑ Oxford. 1991. The Compact Oxford English Dictionary. 2nd ed, Clarendon Press, Oxford. ISBN 0-19-861258-3.